In addition to the many wonderful attractions inside the Hawai’i Volcanoes National Park, there are plenty of other activities in the surrounding area and within an hour's drive from Volcano Village to make your stay on the Big Island exciting and unforgettable! From hikes and beaches to farmers markets, art galleries, waterfalls and so much more, East Hawaii is a lush and tropical gem that offers something for everyone. A visit to this part of the island will allow you to wander far off the beaten path and give you a much deeper understanding of its rich and complex heritage. Here are some of our favorite spots, though this list is by no means exhaustive. If you would like more personalized recommendations, please don’t hesitate to ask! The quirky little town of Pāhoa is the first stop on your way to visit the area affected by the 2018 LERZ eruption, This colorful town is home to many small shops, restaurants, galleries and museums, and makes for a great place to grab breakfast and have a wander on your way down into lower Puna, or enjoy a nice dinner or a cocktail on your way back to Volcano. Secluded by acres of rain forest and lava flows, Pāhoa is like any other place you’ll find in Hawai’i and will begin to prepare you for your journey into one of the most mystical and constantly-changing areas in the state. Kaimū was a small town that was completely destroyed by an eruptive flow of lava from the Kūpaʻianahā vent of the Kīlauea volcano in 1990. In Hawaiian, kai mūmeans "gathering [at the] sea" as to watch surfing. Today you can enjoy the short walk from the parking area to the new black sand beach being formed. This beautiful spot is a humbling reminder of the forces at work on the Big Island and the constant process of renewal that the people here live with day to day. The Kapoho-Kalapana Road, also known as the Red Road, is one of the most remote and scenic drives on the island. It winds north from Kaimū along rugged and breathtaking coastline, through lush coconut groves and tropical rainforests. The road was covered by lava at several points by the 2018 LERZ eruption and journeying along it now is a good way to get a scope of the destruction this event caused. Take time to stop at the many scenic points and small beaches along the way while enjoying the slow pace of life in this part of the world. For decades, the boat ramp and beautiful surf break in Pohoiki Bay have been an iconic spot in the Puna area. Over the summer of 2018 locals and visitors alike watched with trepidation as the lava crept closer to the bay and threatened to engulf the area. When the eruption subsided, strong currents swept tons of newly formed sand from down the coast into the bay, creating the island’s newest black sand beach and warm water lagoon in front of the old boat ramp. A short walk from the water will take you to the edges of the 2018 lava flow. Eerie and wondrous, Pohoiki is a sight to behold. Swimming is currently not advised. While in Kaimū, you should definitely stop by for a look around Uncle Robert’s. This delightful spot is open through the week but Wednesdays (5pm- midnight) are when this normally sleepy beach town transforms into a huge open-air market bustling with local vendors serving up arts and crafts, tasty local food, and live music throughout the evening. It’s a lively and memorable event full of wonderful sounds, sights, smells and plenty of aloha spirit. Spooky and beautiful, MacKenzie State Park a 13-acre recreation area perched on the jagged lava sea cliffs along the Red Road. The signature feature of the park is the largest stand of ironwood trees in the Hawaiian islands and the main attraction is experiencing the raw power of the waves along the sea cliffs. There are restrooms and a covered picnic pavilion. Camping is not advised and rogue waves are extremely dangerous so please heed the numerous danger signs. Park entrance is free but entry into lava tubes or caves is prohibited. Off of Pahoa-Pohoiki Road, and just outside of Pahoa Town is the strange and fascinating Lava Trees State Park. Here you can take the 0.7-mile loop trail in this 17-acre State Monument to view the unusual lava molds of tree trunks, created when a lava flow swept through the area in the 1790, coating the trunks of indigenous ohia trees and leaving tall lava molds in its wake. An easy and accessible walk, this is a wonderful way to see the work of Pele (the goddess of fire) and her amazing sculpture garden. Restrooms, clean water and and picnic tables on-site. Please note: Recovery from the 2018 LERZ eruption is still ongoing. While we absolutely recommend a visit to this breathtaking part of the island, we ask that you heed signs and the directions of local residents and authorities. Exercise caution when in the area and please respect the space and needs of those living in this precious and fragile region as they continue to rebuild. The farthest of our recommendations, but also 100% percent worth the visit, Papakōlea is one of the most spectacular places in the state of Hawaii! The beach gets its unique color from the small volcanic crystals called olivine, eroding from the cinder cone of an extinct volcano that last erupted 49.000 years ago. The panoramic views of the rocky coastline and golden wind-swept dunes are breath-taking and once you've arrived the pristine water and sounds of the ocean will intoxicate you. Please note that the water can get rough and the wind strong, but swimming and snorkeling are possible with better conditions (usually in the morning). You’ll need a good pair of hiking shoes (no flip-flops), lots of water, sunscreen, sunglasses and a hat. There are no facilities at the beach so take care and go prepared. We also ask that you please refrain from taking sand or rocks from the beach. If you love coffee as much as we do, the Ka'u Coffee Mill is a great first or last stop on a day trip from Volcano. A beautiful drive past the Kapapala Forest Reserve will lead you to the sleepy town of Pahala where this local gem produces and roasts quality beans rivaling its more famous cousin from the west side of the Big Island. Stop in for delicous free tastings and tours of the orchards, milling, and roasting processes, and choose from a wide variety of fine roasts, macadamia nuts and gifts from local producers. 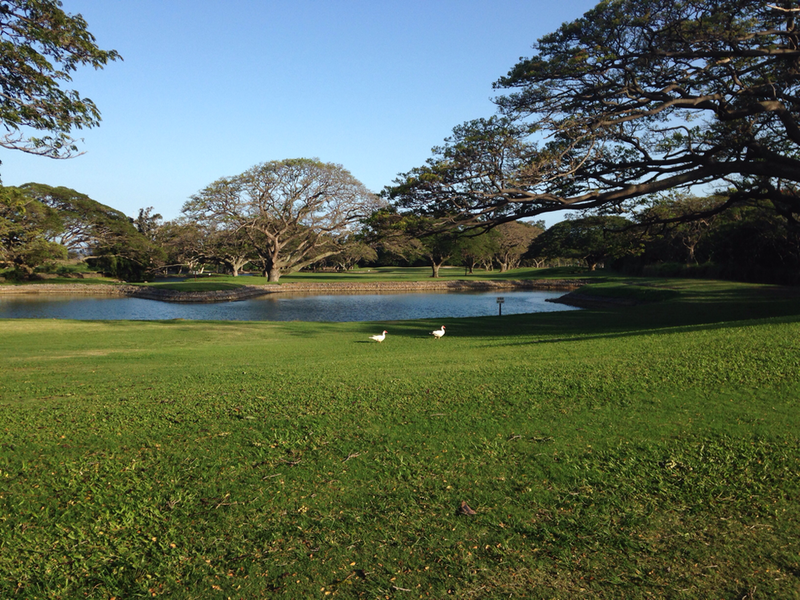 Just up the street from Punalu'u Beach, you'll pass through the rolling green of the Sea Mountain Golf Course. If you find yourself teeing off here, you are truly a die-hard golfer! This rugged 18-hole, 6,416-yard course may lack country club playing conditions, but more than makes up for it with uniqueness and unbeatable natural beauty. Very playable, affordable and off the beaten track! You've made it to Na'alehu! No trip to this beauiful, laid-back part of the island is complete without a stop at Punalu'u Bake Shop for some delicious malasadas. These yeasty, fluffy Portuguese donuts are prepared fresh daily in flavors from taro to their most famous lilikoi! Take a moment to wander through the garden, the gift shop, or to listen to some live music on the patio while you savor your sweet treat from the southernmost bakery in the United States. Located just past Pahala, Punalu'u is one of the most famous black sand beaches in Hawaii! The jet black sand, deep blue waters and swaying coconut palms are a sight not soon forgotten, and a stroll down the beach might treat you to the view of honu (native green sea turtles) napping on the shore. Please resist the temptation to touch these majestic animal and do not remove any sand from the beach. This is not an ideal swim spot but there is a picnic area with restroom facilities to stop for a nice break. Discover remnants of a more prosperous time when the small town of Honuapo, just north of Naalehu, was still a bustling sugar cane center. Today all that’s left is the rusted skeleton of a shipping pier jutting into the bay at Whittington Beach Park. The park here offers magnificent views of the ocean, countryside, and the surrounding cliffs, as well as the odd glance of a Hawksbill turtle resting on the lava rocks or in the tide pools. Past Naalehu and the tiny town of Waiohinu you'll find the turn off for South Point Road between the 69th and 70th mile markers. The drive from here is jaw-dropping, with views of windswept plains and sideways-growing trees all the way to the ocean. Ka Lae is the southernpost tip of the United States and is a popular spot with local fishermen and thrill-seekers that dare to jump from the cliffs to the pristine blue waters below. The snorkeling is also exceptional but not recommended for beginners. Toward the end of the coastal drive through the Keaukaha region of Hilo, you'll come across the enchanting Carlsmith Beach Park. Less a sandy beach and more a series of small lagoons, the ocean water here mixes with fresh underground springs, creating great snorkel and dive conditions. The water is colder than other spots on the island but crystal clear and extremely inviting! Accessible from two entry spots with rails and equipped with showers, restrooms, picnic tables and grassy areas under the swaying coconut trees, this is the perfect place to spend a blissful beach afternoon. Less than a mile from Carlsmith is the majestic Richardson Beach Park, a black sand gem with stunning views of Hilo Bay, lots of space to lounge in the sun or picnic under the trees, and some of the best snorkeling on the east side of the Big Island. Like Carlsmith, this water is also fed by cool springs so bring a rash guard or long-sleeved shirt to full enjoy the delights this beautiful beach has to offer! Toilets, showers and changing rooms on-site. Plenty of parking as well. No trip to Hawaii is complete without at least one really great poke bowl. This delightful fresh fish specialty has been a staple in the islands as long as anyone can remember but more recently has been stealing the show at hip eateries across the globe. Suisan Fish Market offers an array simple, fresh and authentic varieties in an extremely laid-back setting, right in the heart of historic Hilo town. Make your selection at the counter, then grab a table outside or do like the locals do and walk down to one of the picnic tables or benches at Liliuokalani Park. A delicious an unmistakeably local experience! Right in the heart of the the charming downtown area, the Hilo Farmers Market is a wonderful place to experience real Hawaii in a laid back, colorful and friendly environment. The market is open seven days a week between 7:00 and 4:00, but Wednesdays and Saturdays are Big Market days with over 200 vendors drawing people from all over the east side of the island to sample and purchase an array of fresh tropical fruits, vegetables, homemade local specialties, honey and coffee, kombucha, prints and artisanal products from over 200 local vendors. A vibrant and delightful experience for any visitor to the island! Mochi, the sticky sweet rice flour-based Japanese dessert, is a huge staple in the islands and there is nowhere better to get in than Two Ladies Kitchen in downtown Hilo. A tiny, mom and pop operation that has exploded with success but managed to keep it's small operation feeling familiar, this iconic location serves up nothing but the finest quality in flavors ranging from fresh persimmon to crunchy brownie and the legendary strawberry and azuki bean. Do order ahead as they sell out quick! A dazzling natural wonder, the Kaumana Caves are part of a 25-mile-long lava tube winding through the slopes of Mauna Loa. The section of the caves open to the public stretches for approximately 2 miles. Many areas near the entrance are lit by sunlight, but the cave is damp, cool and often muddy, with lots of vines, ferns and roots hanging down from the entranceway and ceiling. Visitors can observe a wide variety of lava formations. Admission is free but make sure to bring flashlights, extra batteries, a light jacket and good hiking shoes. A few minutes down the Hamakua Coast, you'll encounter the turnoff for the scenic drive in Papaikou. While just 4 miles long, this drive will take you through some of the most pristine and lush rainforest on the island with many places to stop and explore the many streams and waterfalls flowing through the dense vegetation. The overlook point at Onomea Bay is a must and to really take in the beautiful scenery, a visit to the Hawaii Tropical Botanical Gardens should not be missed! This is listed by Love Big Island as one of their favorite 5 hikes on the island and we could not agree more! Take a stroll or enjoy a picnic at the Liliuokalani Gardens, named after Hawaii's last reigning monarch, Queen Liliuokalani. This 25-acre Japanese garden, located just off Hilo's Banyan Drive, offers beautiful landscaping, arching bridges over flourishing fishponds, rock gardens and pagodas, Japanese stone lanterns and a lovely teahouse. Views of Hilo Bay and Mokuola (Coconut Island) make this the perfect spot to rest and relax or snap a few shots to make your friends back home jealous. The Lyman Mission House was originally built in 1839 for New England missionaries David and Sarah Lyman. Today, the Mission House can be visited by guided tour, where visitors are given a sense of what the family members’ everyday lives were like in what was then a Hawaiian settlement. A neighboring wing houses Hawaiian culture and natural history exhibits. The wing’s Island Heritage Gallery explores the day-to-day lives of Hilo’s early residents and late 19th century multicultural sugar plantation immigrants. Interactive exhibits in the Earth Heritage Gallery take visitors through Hawaii Island’s multiple climate zones and an indoor lava tube. The ‘Imiloa Astronomy Center is a great way to learn about Hawaiian culture and astronomy. ‘Imiloa means “exploration driven by a sense of wonder and imagination” in the Hawaiian language. The center aims to build a bridge between science and culture through the stars and the mountain of Mauna Kea, where the world’s greatest collection of astronomical observatories are housed. The center offers educational and cultural programs for visitors, students, and local residents through exhibits, activities and a full-dome planetarium. A fascinating destination for those traveling with kids or just interested in looking at the stars. A short drive from downtown Hilo, Rainbow Falls is an 80 ft. waterfall on the Wailuku river cascading over a lava cave that, according to legend, is home to Hina, the ancient goddess of the moon. The Falls gets it's name from rainbows that form in the droplets that surround the falling water, best viewed when the sun is to your back (in the morning). From the falls, you can follow the stairway to heaven up to a second lookout point and wander into the shade of huge banyan trees that have grown to form one enormous and impressive structure, home to many native birds. Further down the Hamakua Coast and above the sweet little town of Honomu, Akaka Falls State Park offers you mindblowing views of two gorgeous waterfalls in one short hike. The walk takes you through a lush rainforest filled with wild orchids, bamboo groves and draping ferns to Akaka Falls (442 ft.) and Kahuna Falls (100 ft.)Take your time on the trail and enjoy the sights, smells and sounds. Don't forget to stop at Mr. Ed's bakery for some excellent cookies and 'Ōhelo berry jam on your way back to Hilo. An iconic spot on the island! Home to more than 80 animals, this 12-acre botanical gem is the only naturally-occurring tropical rainforest zoo in the United States. It features exhibits that are designed to maximize and blend with the natural vegetation of the Pana‘ewa Forest Reserve, which gets more than 125 inches of rain per year. Take a relaxing stroll through the lush landscape of trees and plants, visiting the resident animals along the way. Wonderful for all ages! Free admission, though donations are encouraged. Keiki petting zoo open on Saturdays and the alligators are fed every day @ 1:30pm! We hope you enjoy your stay in our beautiful island home and ask only that you be respectful of our local customs and culture while visiting. Please help keep our beaches, roadways and water clean and heed all signs or instructions given by park rangers or well-meaning locals. Use common sense, avoid leaving valuables inside your rental car and please do not pick fruits or flowers or take rocks, sand or other souvenirs with you. As the old saying goes: take nothing but memories, leave nothing but footprints. E malama pono (take care) and have a wonderful time! We want to extend a huge mahalo to all the extremely talented photographers, videographers and other Hawaii-lovers that have created such beautiful imagery of our island and allowed us to use it for this article. For all imagery not belonging to us, we have tried to track down the original source and cite properly. If you are the owner of any of the images above and it is not being given proper credit, please let us know.